Bring Your Designs to Life by Adding Some Sparkle! 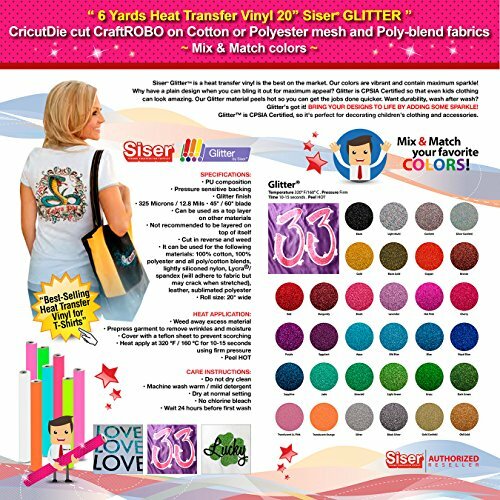 Our Glitter heat transfer vinyl is the best on the market. Our colors are vibrant and contain maximum sparkle! Why have a plain design when you can bling it out for maximum appeal? Glitter is CPSIA Certified so that even kids clothing can look amazing. You can also sublimate directly onto Siser Glitter! GlitterTM is CPSIA Certified, so it's perfect for decorating children's clothing and accessories. Available in: Glitter Light Multi, Glitter Sapphire, Glitter Blush, Glitter Royal, Glitter Blue, Glitter Old Blue, Glitter Burgundy, Glitter Jade, Glitter Eggplant, Glitter Black Gold, Glitter Black Silver, Glitter Bronze, Glitter Cherry, Glitter Lavender, Glitter Grass (Green), Glitter Aqua, Glitter Dark Green, Glitter Light Green, Glitter Hot Pink, Glitter Red, Glitter Gold, Glitter Silver, Glitter Black, Glitter Purple, Glitter Emerald, Glitter Copper, Glitter Confetti, Glitter Lt. Silver Confetti, Glitter Lt. Gold Confetti, Glitter Old Gold, Glitter Lt. Pink (Translucent) and Glitter Translucent Orange. Please send us an Amazon message with your color selection. One yard minimum per color.